Are you looking for Value and Affordable Air Purifiers? *If you have kids with asthma, allergies, mold allergies or other respiratory conditions, you know you need to clean the air. Odors like ammonia and hydrogen sulphide from the air. Gases like carbon monoxide and nitrous oxide, untouched by every other technology on this site, are destroyed. It can eliminate particles down to 0.001 microns from air, these are the tiny microns that can be inhaled deep into the lungs and cause major damage. Most air purifiers are not capable of this feat. Indoor Air Pollution Affects Everyone Great news! Live in clean air. Definitely open your windows because the air outside is far less polluted. And while you are at it, let some sunshine into the house. Mold does not grow in sunlight. Buy the least amount of chemicals and cleaners. Do not use air fresheners to freshen the air. They are loaded with harmful chemicals. The big one: do not smoke in the house or anywhere around family members. Better yet, stop smoking. Use allergy air purifiers alone to clean the air. Live healthy…Be happy. Fall and Winter mean that stagnant air increases the likelihood of asthma attacks, colds and other respiratory infections. With the heating systems working in full force and the windows shut, there is no real source of fresh air. The daily use of chemicals pollute the air from the household cleaners to what we use to clean the toilet and even our hair spray. The National Institute of Health states that half of all homes/buildings have water intrusion. This means mold in most cases. Mold in most cases in the basement. Mold and the indoor air pollution contribute to the growing cases of asthma in children. Why are Asthma Rates Rising? Lack of fresh air in our airtight homes. Modern homes are built for energy efficiency and are air tight. People do not open windows in the winter. The air inside of homes is 2 to 5 times more polluted than outdoor air. People do not think there is any reason to clean inside air. Folks use chemicals freely because of slick advertising. Many chemicals cause and trigger asthma attacks. Especially those with strong fragrances. There is a strong lack of understanding as to what kills mold and where mold is found. The need for clean air inside the home is vital to formation of the delicate lungs of children. Doctors do not address mold and indoor air pollution and their impact on health. 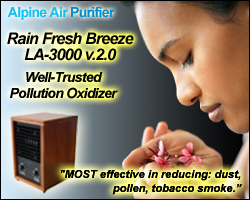 What Makes Alpine Air Purifier A Great Find? Risk free $ 0.00 free 30 Day Trial. You Don’t Like It. Ship It Back on Alpine Air. I love my Alpine Air Purifier. We can’t live without one of these machines. Arkansas firone of the worst states for living with allergies. The Alpine Air Purifier make living here bearable. …When we have someone new over to the house they notice the air right away. They say, wow, it smells like it just rained in here.